We begin by deploying our staff to prospective sites to meet with church and community leaders, and to inspect existing water sources. Beneficiaries are selected based on need, population served, and the church's ability to govern and share the well. Tukutana staff form a water committee comprised of church leaders and village officials. The committee meets regularly to pray for the well and its users, and to ensure the well is being properly maintained. The group also resolves any conflicts surrounding the water source. A Covenant Agreement (Memorandum of Understanding) is signed between Tukutana and the water committee chairman. This document lists the owner of the well and outlines terms for using and maintaining the well. To determine the most probable location for striking water, our team and hydrogeological surveyors study the topography and soil conditions. A seismoelectric survey instrument is used to predict the likelihood a water table with pure water exists beneath the layers of earth and rock. Our children, they may now attend school because they will no longer have to travel far to collect water from small creeks shared by livestock. Tukutana contracts a state-of-the-art rig and highly repuatable crew to drill the well and install the pipes and hand pump. 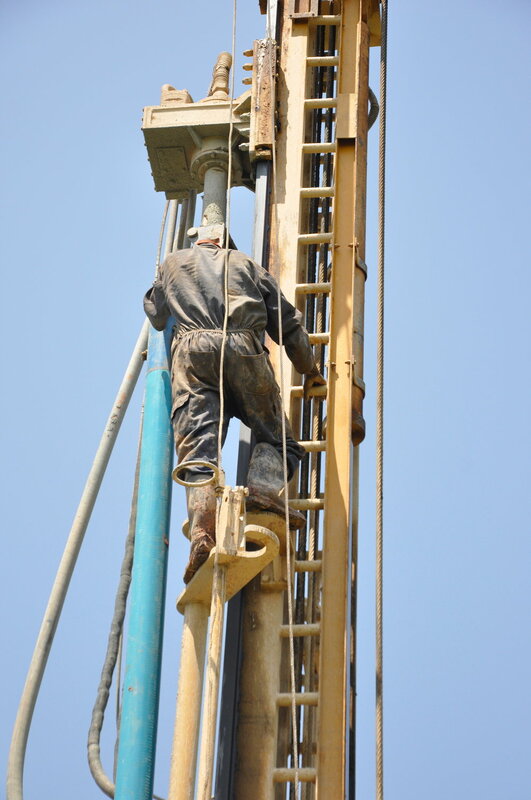 Drilling typically takes 10 to 18 hours. Water, in the eastern Ugandan region we serve, is most often struck at depths of 50 to 80 feet. After striking water, the borehole and pipes are flushed until the local water inspector gives a report indicating the water is pure and safe to drink. At that point a hand pump and cement drainage tunnel are cast. Following a ceremony to thank God for the provision of water, the well begins serving the church and community.